Slow Down, Molasses has made quite an impression on the psychedelic music scene both at home in Canada and abroad. On May 12th the group will release their latest full length album, Burnt Black Cars. Personally, I'm not certain that the hype is warranted. The album gets off to an incredibly slow start with the gelatinous blob of an instrumental "Intro". It's a harbinger of things to come. Whether it's the monotonous drone of "Stay Still", the slow burn with weak payoff "City Sublet", or the October-era U2 sound of "Home", you'll be constantly begging for more to happen. The title track seems destined for the same fate. It begins life excruciatingly slowly, but it finally bursts forth into an epic guitar part, reminiscent of mid-90's Sonic Youth. By mixing the vocals way to the back, "Summer Sun" puts the emphasis on some pretty slick glistening guitars. The final cut, "Underneath the Cobblestone", sounds far too close to the Besnard Lakes' "Disaster" for comfort. I think the advice here would be, hurry up molasses (I know not very original). 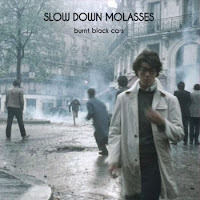 Slow Down, Molasses plays CMW tomorrow. Best tracks: "Burnt Black Cars", "Summer Sun"